WHEN: November 11th and 12th, 2017 from 10am to 5pm. Looking for the perfect gift? Something local, something hand crafted, something really special? 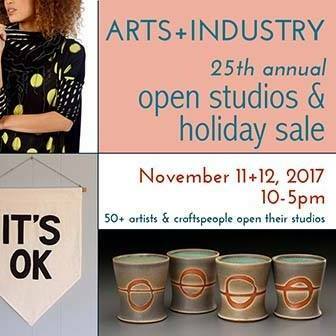 Then the Arts & Industry Open Studios and Holiday Sale might be the place for you! Check out this former toothbrush-factory-turned-artists-studios and marvel at the amazing works of art! Find treasures for yourself and those you love. Over 50 fine crafters and fine artists, including some nationally recognized clothing designers, jewelers, potters, and woodworkers open their studios to show off their best work. You will find painters, sculptors and a variety of creative people. With four new artists who upcycle, recycle, reuse and repurpose found objects there is something for everyone, adults and children. Talk with the distinguished artists about their work. Enjoy live entertainment and catered cuisine. Begin your holiday shopping with some unique handcrafted gifts. Buy direct while supporting our local creative arts economy at Arts and Industry Open Studios.